"I'm sure other people in the business have considered reasons why they're doing what they're doing, but I do think that if you're gay you have a responsibility to come out." 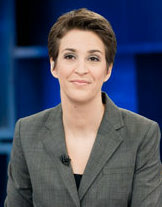 - Rachel Maddow, in a profile by the UK's Guardian. Whoever could she be talking about?